Orchidtent Coffee Maker dust Cover – 11W x 9D x 11H-Waterproof, Universal Fit- Fits EC155 15 BAR Pump Espresso and Cappuccino Maker (For De'Longhi EC155) by Orchidtent at Just Gathering. MPN: 4335463464. Hurry! Limited time offer. Offer valid only while supplies last. Each cover has an portable Hand straps and open bottom and slips over the top of your item, and can easily be folded and stored when not in use. Each cover has an portable Hand straps and open bottom and slips over the top of your item, and can easily be folded and stored when not in use. but it can also guard against equipment failure and improve performance. Our Dust Covers guard against dust build up before it happens, as well other debris, fingerprints, static, moisture, wind and other contaminants. 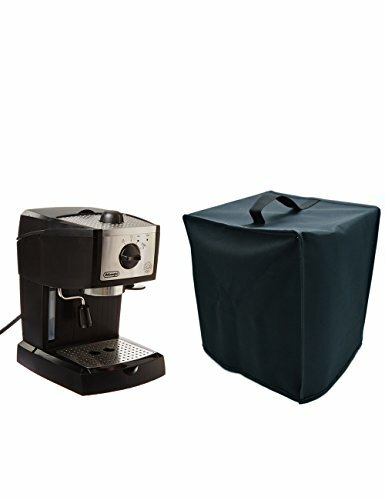 These protective dust covers are individually made to fit the dimensions of the popular Coffee Maker. The color of this dust cover is black. Our dust covers are made from anti-static, HIGH QUALITY, 600D water-resistant nylon that is extremely STRONG and DURABLE. Material ：Water-resistant and dustproof nylon. Made of nylon fabric, built in heat-resistant material, waterproof and dustproof. Foldable - Can folding into a small, space-saving, easy storage. Applicable to EC155 15 BAR Pump Espresso and Cappuccino Maker. Best tool in the kitchen - Are you still worry about the Coffee Maker with dusty? Choose the cover, you could never see that! If you have any questions about this product by Orchidtent, contact us by completing and submitting the form below. If you are looking for a specif part number, please include it with your message.